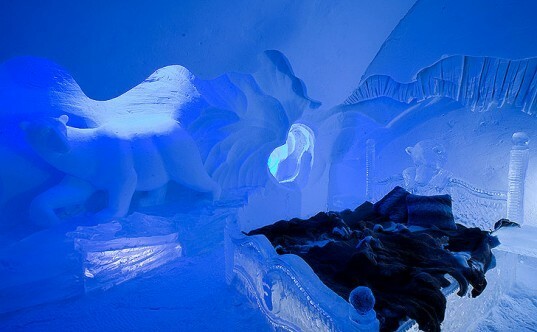 There are several ice hotels in the frozen region of Scandinavia, but Hotel de Glace is North America’s only ice hotel. Made from 15,000 tons of snow and 500,000 tons of ice, the hotel takes 60 workers around a month to build each year. Moulded with metal frames, the hotel is built like a sandcastle, then allowed to harden in the chilly air of the Laurentian mountains for a few days before the supports are removed. The ice walls are four feet thick, acting as a natural insulator, although extremely cold themselves. All of the furniture and décor throughout the hotel are also made of ice. Inside, the hotel hosts up to 36 rooms, which are made from ice bases, but topped with mattresses, deer pelts, and then Arctic sleeping bags to keep guests toasty. Guests are also encouraged to wear three layers of clothing, as the rooms average between 23 and 27 degrees Farhenheit. They are also asked to use the outdoor spas and saunas to warm up before bed. 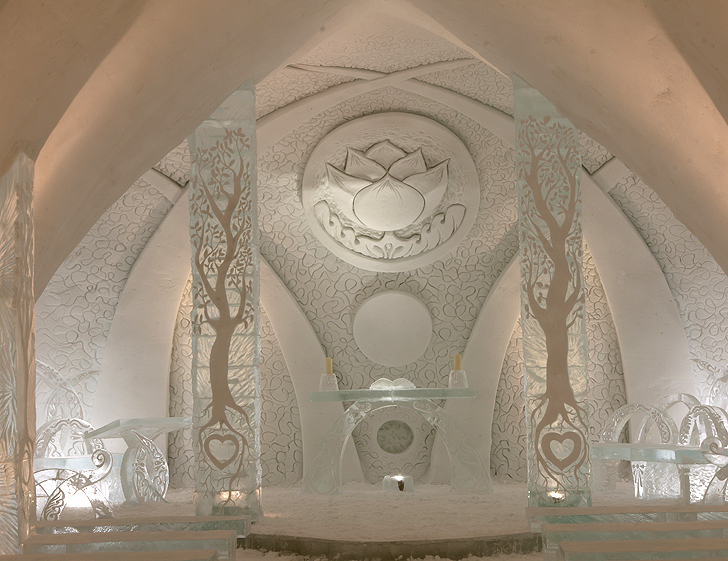 The rooms and public areas of the Hotel de Glace are beautifully sculpted and carved. Columns, archways, decorative sculptures and animals glitter as colored lights are projected on them. The Ice Bar serves up cocktails in their very own glasses made of ice, and the Ice Café can easily be converted into a 150 person chapel for Nordic weddings. The unique hotel can be experienced as an overnight stay or as a day tour. Inhabitat looks forward to visiting during the 2012 season! There are several ice hotels in the frozen region of Scandinavia, but Hotel de Glace is North America’s only ice hotel. Made from 15,000 tons of snow and 500,000 tons of ice, the hotel takes 60 workers around a month to build each year. Moulded with metal frames, the hotel is built like a sandcastle, then allowed to harden in the chilly air of the Laurentian mountains for a few days before the supports are removed. The ice walls are four feet thick, acting as a natural insulator, although extremely cold themselves. All of the furniture and décor throughout the hotel are also made of ice. Inside, the hotel hosts up to 36 rooms, which are made from ice bases, but topped with mattresses, deer pelts, then Arctic sleeping bags to keep guests toasty. Guests are also encouraged to wear three layers of clothing, as the rooms average between 23 and 27 degrees Farhenheit. They are also asked to use the outdoor spas and saunas to warm up before bed. The rooms and public areas of the Hotel de Glace are beautifully sculpted and carved. Columns, archways, decorative sculptures and animals glitter as colored lights are projected on them. The Ice Bar serves up cocktails in their very own glasses made of ice, and the Ice Café can easily be converted into a 150 person chapel for Nordic weddings. The unique hotel can be experienced as overnight stay or as a day tour. Inhabitat looks forward to visiting during the 2012 season!